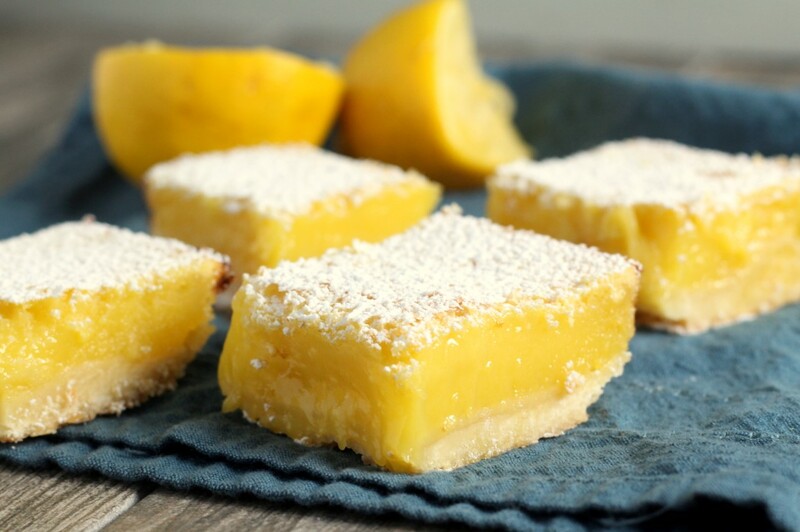 Smooth, tangy lemon filling baked on a shortbread crust and dusted with powdered sugar. 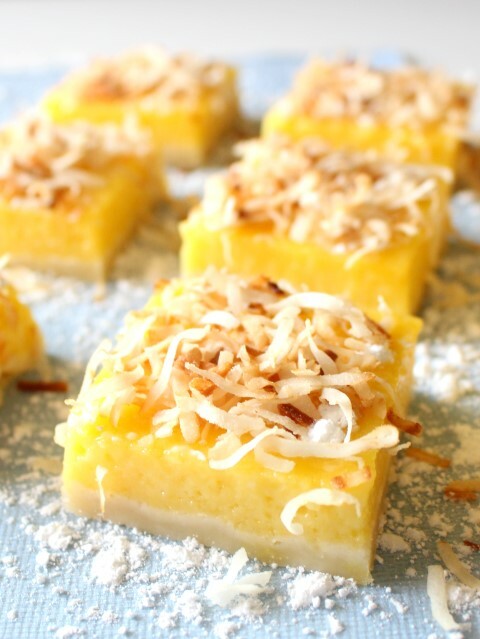 This is a total side track topic since I’m not feeding lemon bars to my baby yet. But, have any of you made your own baby food? I’ve just started into this venture and could use some tips. Right now, I’m feeding him basic purees, peas, sweet potatoes, apricots, avocado. The hardest part is figuring out how to freeze it. Using ice cube trays to freeze it until it’s solid and then transferring the frozen cubes to ziploc bags is clunky. But buying individual containers for each meal is pretty expensive. Give me your best tips for baby food storage. Preheat the oven to 350 F. Grease a 9 x 13 inch baking pan. To make the crust, beat together the butter and powdered sugar until fluffy. Gently stir in the flour just until combined. Press the dough into the bottom of the 9 x 13 inch pan. Bake at 350 F for 16-18 minutes or until lightly browned. Let cool completely. Meanwhile, to make the filling, whisk together the eggs, sugar, lemon zest, lemon juice and flour. Pour over the cooled crust. Bake at 350 F for 30-35 minutes or until the filling is set. Let cool. Dust with powdered sugar before serving. Store in the refrigerator. Mallory!!! I made them yesterday and they’re AWESOME!!!! I’m glad you liked them, Leidy! Hi Mallory. I made these lemon bars today and they look awesome. I was wondering if you can freeze them? Hi! I made them yesterday and they’re delicious. But.. It’s hard to detach from pan, and generally- it seems as though the crust is up, and the mushy lemon dough is down. How is that possible? I did, of course, bake thr crust first.. I just made these. They came out perfect. I baked them on parchment paper and they are easy to take out. I don’t know why yours came out upside down. Maybe you didn’t press down the crust hard enough? I also pressed some crust up on the sides in the dish before baking, just a bit and poured the filling on the crust while it was still a little warm(I got impatient lol) Perhaps that helped. 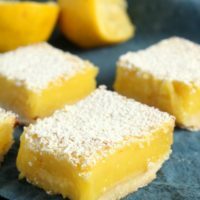 I made these lemon bars and everyone loved them. I just have a question about them. How does the crust end up on top? Does this happen when you make it? I followed the instructions. 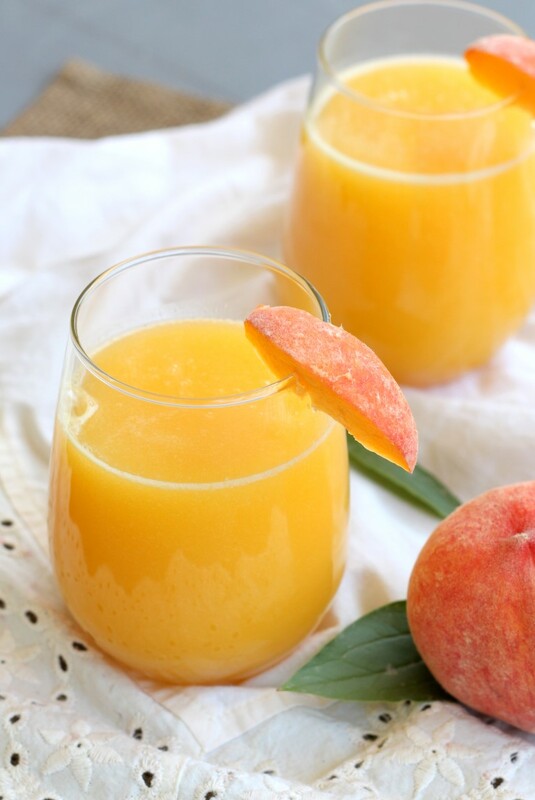 Any thoughts on how many large lemons might be required for 1 cup of juice? In my experience, a large lemon yields approx 1/4c of juice. I made these too & the crust ended up on top. I even used parchment paper & the lemon layer went below the parchment. I followed directions to a tee & I don’t know what happened. Made these today, turned out so delicious! Love lemons in baking, gives it a freshness that is hard to achieve in baking otherwise. These were super super sweet and I was so dissapointed! Made these tonight. It was so good. I baked the crust a little longer and before baking, I poked holes in the crust with a fork. It came out perfect. I have made these several times now. 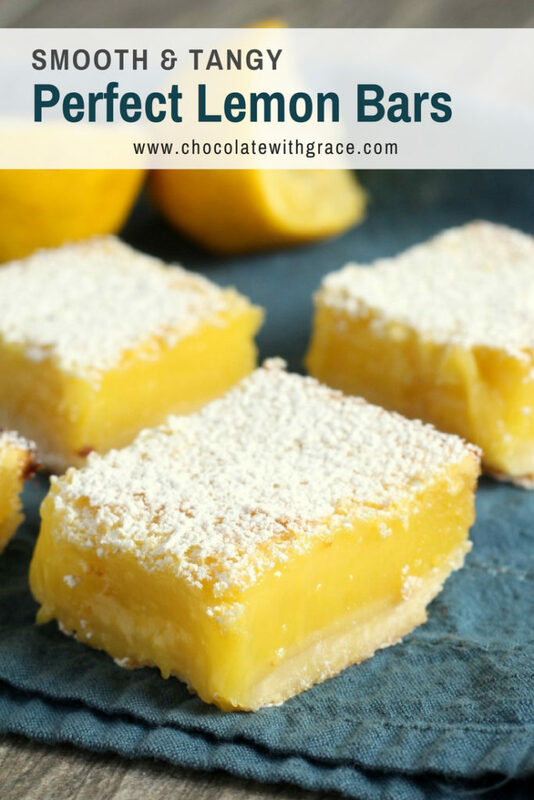 They are the best lemon bars ever! Only thing I do different is that I put a lemon flavored frosting on top. Powdered sugar, lemon juice mixed together. I made these last night. As others are saying the crust went on top. Well mine ended up with crust on top and the bottom lol. And the lemon mix is in the middle. I dont know what I did put they look pretty cool. I like how the lemon ended up in the middle. ? 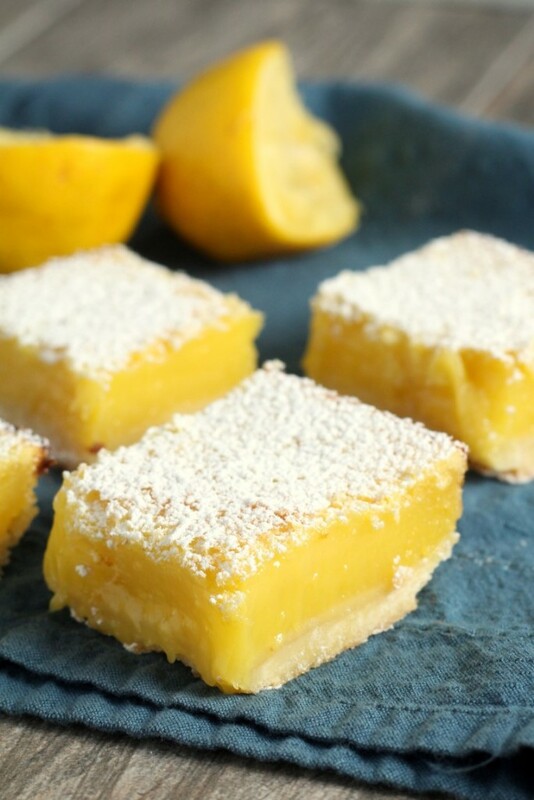 These lemon bars were fantastic, Everyone at my birthday loved them!